Plantain (Plantago Sp.) First Aid etc. This week I am excited to share with you one of my favorite medicinal plants. This plant is known as Plantain. This is not the plant you may have heard of called “Plantain” that is similar in appearance to a banana and is in fact delicious sliced and fried. 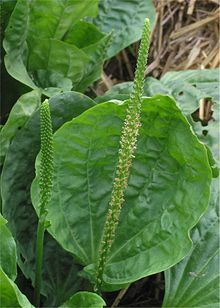 The plant that I am referring to is either one of two plants in the Plantago genus (genus is the first of the two names in the scientific name of a plant/ animal/ organism): Narrow- leaved or English Plantain/ Plantago lanceolata, or Plantago major/ Common or Broad- leaved Plantain. Neither is native to North America but both are commonly naturalized, that is you can find them pretty much everywhere throughout the United States (at least one or the other). Plantago major/ Broad- leaved Plantain. Note the ribs that run the whole way through the roundish leaf. These ribs serve as important distinguishing features of both this species and the Narrow- leaved variety. Also note the distinctive seed stalk. Narrow- leaved Plantain- note the narrower leaves, which still have the distinctive veins (if you flip the leaf over the veins stick out). The seed/ flower stalks are different in that in the preceding species the flowers and then seeds are present all the way up the stalk, whereas in this species the flowers and then seeds are only at the top of the stalk. As I have mentioned this is one of my favorite medicinal plants. Recently I was on a camping trip with my two children, my boyfriend and a friend of ours, whom at some point asked me if I had a First- Aid kit with band- aids along. When I replied that I didn’t, she was surprised, as she would have figured that when I was transporting my children I would at least have thought to bring Band- aids with us. While of course she was right and since then I think of First- aid as a category of things to bring on any trip, at the time I thought, well, what would I do in a case where some kind of First- aid is needed? And my answer was, I would look for Plantain. It so happened that at the gas station where this conversation took place there was a lawn- like area which contained several Plantain plants. I explained that in the case of scrapes and cuts I would use the Plantain as treatment. To use the plant as a poultice, simply pick a leaf (of either of the above named species) and chew it lightly between your teeth. When it has been rendered into small pieces stuck together with saliva (yes it works well this way) take it out of your mouth and place the leaf on to the affected area. When it dries it is like a natural Band- aid that aids healing. In addition to shielding a compromised area (cut/ scrape etc.) from outside influence, Plantain also guards against invasion by infection. “Science has vindicated utility in healing sores, with mild antibiotic and anti- inflammatory.” -Peterson’s Field Guide to Eastern/ Central Medicinal Plants and Herbs. Besides being at least miraculous in terms of healing cuts and scrapes, I have seem Plantain work as a laxative. It is closely related to Psyllium which is widely recommended as a laxative, which is in fact Plantago psyllium. As martial artists and as active people the use of Plantain as a healer of any skin abrasion including cuts and scrapes can not be marginalized. If you have seen it as you may well have in a lawn near you, as it grows in many lawns, try it, you are likely to be amazed. Previous PostTime Management – Why would anyone want to live like that?